Exciting Music Lessons in Worcester, the teachers are friendly and experienced and teach from our Worcester Premises. Personalised messages, with various cool designs to get your message across. The music tuition gift vouchers come in a presentation box. ABRSM, LCM Rock School and ICMA music grades available. We prepare students for all levels and music grades. Providing music lessons in Worcester UK. The Music tuition covers the more common instruments, and all basic styles of playing, such as Rock, Pop, Jazz and Classical is taught. We teach children and adults to play various instruments such as guitar (both electric and acoustic), electric bass guitar, singing lessons and vocal coaching, piano and keyboard lessons as well as drum tuition. If you want to learn to play an instrument purely for pleasure, or your goal is to take music grades, we can provide experienced, friendly teachers that will make your music lessons fun and rewarding. The guitar tuition covers ALL playing styles. Our teachers provide guitar classes in both folk and classical styles of playing. Electric Guitar tuition for most playing styles including Pop, Rock, Blues and Jazz styles. The guitar classes are suitable for children and adults. Beginner guitar lessons are taught as well as advanced lessons for experienced players. Singing lessons for Pop, Rock, Classical and Music Theatre. The Lessons cover all the important vocal techniques to make you a better singer. Improve your singing Today! The singing teacher(s) are experienced performers, recording artistes and they are friendly! Singing classes for beginners and intermediate levels, we teach children and adults how to sing. Classical and Pop / traditional piano lessons. Beginners lessons to advanced levels are taught. Music grades can be taken. Learn to play various styles including pop, classical, swing. Play your favourite theme tunes or chart hits. We teach beginner to advanced keyboard levels. Music grades available. We can help you with your music GCSE course work including music performance and GCSE music composition. Need a little help with your music theory or composition? We're just a call away! Are You looking for something that's not listed? Please give us a call, because we may still be able to help. Music lessons are taught Monday to Friday daytime and evening 9.30am - 8.30pm, and on Saturday 9.00am - 4.30pm. There is roadside parking outside the premises (no time limits). The music school is 5 minutes walking distance from Worcester Shrub Hill train station. View where we are. How do I pay for music lessons? 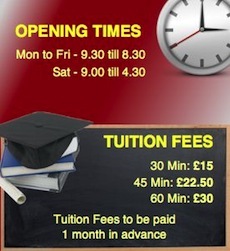 We accept cash, cheque or bank transfer for tuition fees. The teaching rooms are airy and clean. All rooms are treated acoustically for a great sound. Sit quietly, read a book and relax on our comfortable sofa's whilst waiting to collect your siblings. All parents and students can use our wireless broadband service whilst waiting, just ask for the login access and you're good to go! Website design by rapid-dsign © 2011 The Music Chamber School of Music providing beginner and advanced music tuition at our Worcester premises.